Looking for a Boost to Help You Pay Down Debt? Join the Debt Movement! One of the hardest things about getting out of debt is the fact that sometimes you feel as though you are all alone. After awhile, you begin to feel discouraged, and you suffer from the lack of support. If you want to succeed with your debt pay down goals, you need support and help. And if you really want to kickstart your current efforts, a little enthusiasm helps. Jeff Rose, the blogger behind Good Financial Cents, is becoming quite well-known for his financial movements. And right now he is in the midst of the Debt Movement, an effort to get consumers to collectively pay down $10 million of debt in 90 days. You can join the Debt Movement at any time in the next 90 days, but the earlier you join, the more progress you will make. Jeff has teamed up with ReadyForZero, which can make it easier to order your debts, make a pay down plan, and track your progress. Joining the Debt Movement can connect you with hundreds of others working toward their goals of debt pay down, as well as provide you with the motivation you need to keep it going. On top of gaining access to education and community resources, as well as helpful and practical tips, the Debt Movement is also offering scholarships. Some of those who participate will receive debt scholarships designed to help them turbo-charge their efforts. However, you can't get access to the scholarships if you don't sign up and participate. And, even if you don't end up with one of the scholarships, you are still likely to make notable progress during the time of the Debt Movement. The reality is that debt is a drain on your wealth. When you are paying interest to someone else, you are sending your own money out of your control. You aren't able to direct your financial resources in a way that results in more wealth for you. Debt can place strain your relationships as well as on your pocketbook. Getting out of debt is the first step toward financial freedom. Think about your finances. Are you over-leveraged? Do you have too much debt? Do you wish that your money could go to improving your life, rather than just paying interest and other obligations? One of the best things you can do is make a plan that allows you to get rid of your debt as quickly as possible. Think about how much you can spare to set aside for debt reduction, and take the plunge. Joining the Debt Movement can be a great way to boost your efforts. You'll find a supportive community that can help you stay focused on the goal. Plus, you can receive practical tips and strategies for paying down your debt faster so that you pay less in interest overall. Think about joining the Debt Movement and tracking your progress. You will have more of your own money at your disposal, and you will be well on your way to financial freedom. 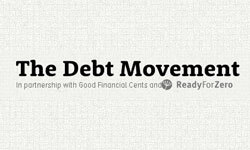 The Debt Movement is an absolutely amazing concept and I would encourage anyone who has debt to join!